Note: I don’t reveal any massive spoilers as it’s a brief review of each book, but – beware! This series was wonderful to read. Combining the fantasy of fairy tales and the eccentricities of science fiction, Marissa Meyer painted a very unique portrayal of a dystopian world. It’s very much chick-lit, but the series’ characters are so likable in their own flawed ways that it’s impossible not to adore them. I’ve read 5 of the books in this series, but I have yet to read Stars Above (book #4.5), which will presumably detail more about the main characters’ earlier lives. Below I have written a mini review for each of the 5 books in this series. I read Cinder about a month ago and read the following books fairly quickly, so forgive me if my reviews are not very polished. I didn’t know what to expect from this first book, but I have to say that I was slightly disappointed when I first read it. I didn’t find the sudden turn of events in Cinder’s mundane life very… believable, such as Kai’s ‘casual’ strolls in the city to see Cinder, despite the fact that letumosis was literally killing people next door. 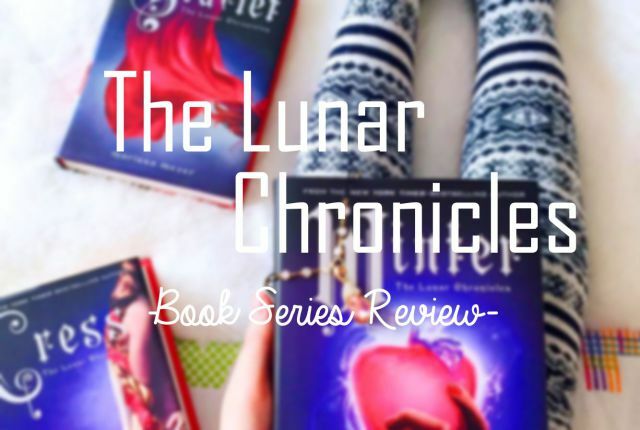 However, I liked the characters very much: Cinder, Kai, Iko, Peony, and the fact that, as a reader, I was left with so many questions about Princess Selene and Queen Levana’s tyranny was good enough of a reason to urge me to continue reading. I absolutely loved these two characters. Scarlet is my favorite female character of this series, and it was amazing (and heartbreaking) to see Wolf battling between being controlled by the Lunars and his innate instincts to protect Scarlet. I didn’t really like the simplicity of how the saving-Michelle-Benoit mission went on, as it was a really stupid plan, to be honest. Back to Cinder – her friendship with Captain Thorne is just too good to be true. I loved how the progression of both story lines led to the understanding of Cinder’s past, and of them finally meeting up at the end of the novel. This seems to be the novel that the previous two books have been building up to. We’re introduced to Cress, a genius, but naive, version of lovely Rapunzel. Though the timing in which the other guys rescue Cress is off, creating a lot of drama and desperation, everything works out at the end. Sort of. This enabled us to see a ‘different’ side of each character, such as Thorne, Wolf and – of course – Cress, which just made them even more lovable. There are a few other massive revelations here – which I won’t spoil, but it was quite heartbreaking to see how the people of Earth and Luna are not so disconnected after all. Reading this book was so painful. This novel is a prequel to the series, and tells the story of how Queen Levana became Queen Levana. She was treated horribly in her early life, as predicted, but it did not cause me to feel more sympathetic towards her, at all. The other main characters have had their share of a cruel childhood, and none of them became Levana. Not even close. I loved the complexities of this novel. There was a lot of climatic moments, and I gave this novel a 5/5 because there were many (small) details that could have made this novel go wrong, but Meyer addressed each and every one of them so that we are left with zero doubts. However, I did not grow to like Winter very much. It seemed to me that her stunning beauty, good intentions and reputation spoke more about her than what she could have done. I was waiting for that ‘moment’ all throughout the book, but Winter quite disappointed me at the end. Meanwhile, the other 3 girls were absolutely fierce in their own ways: Cinder as the hero of the entire series, Scarlet as the Alpha of the wolves (and Queen of Sass), and Cress as the absolutely genius programmer and hacker. As for the guys, though they were portrayed as more secondary characters, their charm and strength was evident when they carried out their mischievous plans in Luna: Thorne being the martyr for Cress when they broke into the palace, Jacin being one true loyal guard to Winter, Kai being the best (but kind of useless) political version of an Emperor that he could possibly be under the circumstances, and Wolf being… Wolf. In terms of the plot, you could see how the world expanded by each book. From New Beijing in #1 to France in #2 to the entire world and space in #3 to Luna in #4. This whole dystopian world was meticulously created, and I really think the author did a wonderful job at that. As for the characters, though I originally had concerns about how the author would make them distinctive, that worry was soon gone. Though the group of protagonists are all ‘good’ characters, it is clear that none of them are flawless. And that is precisely what makes them more lovable. Finally, the writing style. Though I was not really a fan at first, I then started to see how the author’s style was very complementary to the series. And I actually liked it (this doesn’t happen very often with contemporary authors). Along with the creation of a dystopian universe and unique characters, the writing style did its job to make them possible. What was your favorite book of the series, or are you planning to read (any of) them?